Ever been to a thrift store? Amber had nothing in her previous home that came from the thrift store. After her move and a day of 'thrift store hopping' this has changed. Now quickly read her blog for some cool tips. In the meantime it has become a kind of sport for me; finding nice items at the thrift store. It has gradually crept in; in our previous home no recycled finds were to be found, but since our move and a day of 'thrift store hopping' I am addicted. What I like so much about the second-hand accessories is that they carry a story with them. Even though you may not know the story, it does give a personal touch to your interior. The combination of vintage and new accessories makes the house 'our home'. For example, I recently bought a beautiful old-fashioned suitcase that looks amazing inside our cabinet. I also find the old book in the picture above fantastic; I combined these with a cactus and Sri Lankan money (from the trip that my friend and I made last year) for the personal touch. The sewing machine is a real eye-catcher and I got it as a present from my aunt during a day of 'treasure hunting'. In the same shop I also bought two old-fashioned cameras that get a second life in our house as accessories instead of utensil. My friend has a small collection of Queen LPs from which I have chosen the nicest cover from and also use as decoration for in our closet. Look for a good thrift store! Yes, not every thrift store is the same. Shopping in a location where it smells like a house from the 18th century and all products are messy together, is no fun and you will probably not find your 'pearls' here. 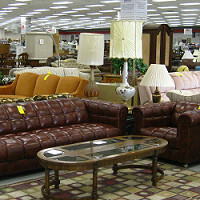 Go for a thrift store where everything is neatly and orderly set out. In these types of stores you can often search for the good quality bargains you are looking for. Personally, I think 'Age UK' is one of the nicest thrift stores. You can really find everything in thrift stores; but especially a large amount of junk. Between that junk you will only find a small percentage of beautiful things. It therefore requires a lot of research to find them. So take the time and have patience. Walk through all the aisles and check everything. The more you look, the more likely you are that you are running into something fun. Get out of your comfort zone! If you find something you like, but do not you think it fits into your interior; just try it! It could be very cool in combination with your own stuff. And if necessary you can make it fit perfectly with a few small adjustments (Like a lick of paint). Which also helps; Take a look at Pinterest and do some recycled inspiration there! You should only do cycles if you enjoy it. If you approach the stand while thinking in advance that there is only garbage to find and do you find used stuff dirty? With that approach you will never find your ultimate find. You will have to be open for it! What makes it extra fun; they often have a cozy cafe where you can enjoy a nice cup of tea with something tasty between shopping!